Shutters and Millwork Industries offers suggestions on how to care for and protect your plantation shutters. 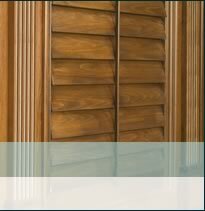 For Stained Shutters: Dust with any household wood polish(non-solvent based) with a soft cloth. Our clear coat finsih has the same properties common to most stained household furniture. For our Premier Painted and Quik Wood line, use a household grade window cleaner and a soft cloth. For Tech based products use a duster or a household window cleaner and a soft cloth. DO NOT USE: ACETONE OR NAIL POLISH REMOVER, ANY SOLVENT BASED CLEANER, MINERAL SPIRITS, HARDBRISTLED BRUSHES OR SCRUB SPONGES. Any of these items will severly damage the finish and the feel of surface.